With Monsoons at the doorstep and Colleges about to start with the new session, the timing could not be better. The much awaited End-of-Season Sale is back again at Pacific Mall, one of India’s leading premium shopping and entertainment destinations. With the trendiest in Fashion at incredible prices, exciting offers, great genuine discounts across brands and all major categories the End of Season sale is on from 24thJune to 23rd July 2017. 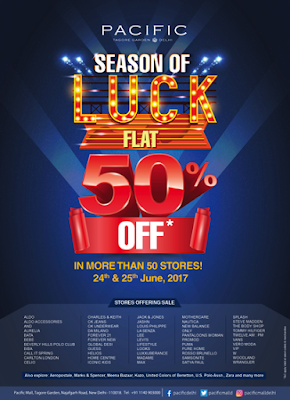 The Pacific Mall ‘Season of Luck’ showstopper isa flat 50% across more than 50 stores present at the Mall. Throughout this period, customers will have a chance to splurge on the seasons best deals, never-before discounts and a host of exciting games and offers along with fun filled activites, entertainemnt and live shows. Along with offeringthe best in discounts, Pacific Mall at Tagore Garden also showcases a range of high street fashion, international styles, and latest styles for its customers to indulge in a shopping spree this monsoon season. Shopping is surely not going out of fashion at Pacific Mall, with 130 international and national brands as it is a shopping, entertainment and leisure extravaganza 365 days a year!